Bob Edmonston, one of our longtime members died last night (July 21). 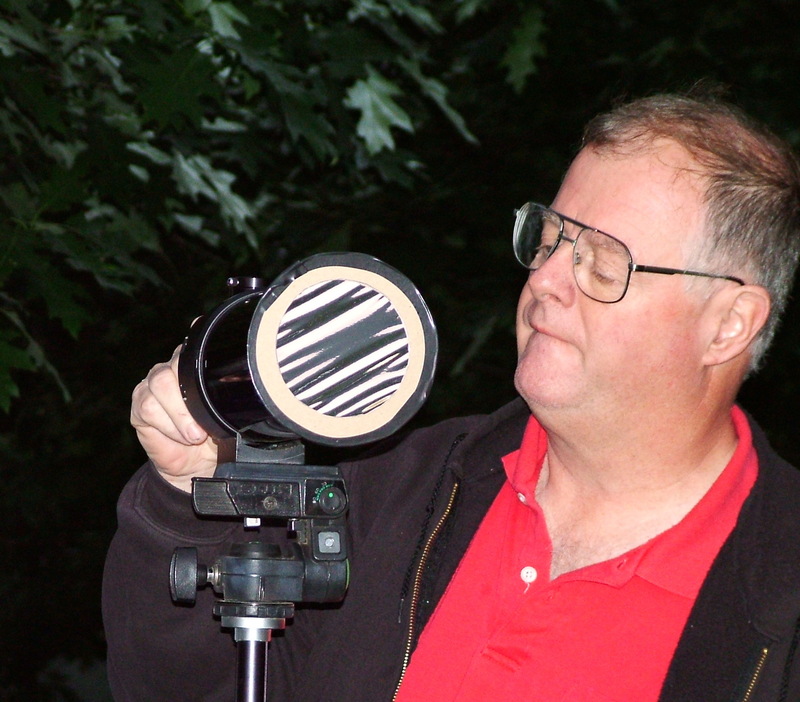 This is Bob at the Venus transit event in 2004. 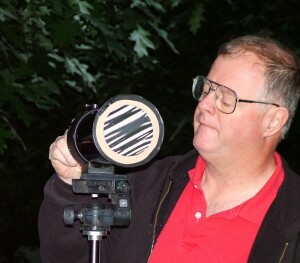 For many years Bob helped with our star party by taking care of the A/V needs. He brought his bus to the event that served as CPO headquarters. He was always willing to roll up his sleeves and work hard to make it a success. Bob was my go to guy to solve problems having a soldering iron in one hand and duct tape in the other. Bob and I rigged up a satellite system to televise the Penn State game at BFSP 2010 that almost got us kicked out of the park. We spent many a night together observing from the Port Matilda mountain sight to the overlook half way up 144. We traveled together to Frank and Judy’s house for the VA star party shooting the breeze the whole way down and back. Bob worked for Piper many years ago and had a love for Lock Haven (he was mayor for a few years). We’ll miss ya Bob! On July 21, Bob Edmonston ended the journey of his life at the Penn State Milton S. Hershey Medical Center, succumbing to a stroke as a complication of leukemia. He was 72. Bob was a man whose mind and hands were always engaged, fascinated by the next task to do, computer problem to solve, car to fix, or house to remodel. For much of his life, he used that inventiveness in service to others. He followed a family tradition. He was the great-great grandson of Lock Haven’s first mayor, L.A. Mackey and the grandson of Calvin and Molly B. Armstrong, a couple who dedicated their lives to helping Lock Haven. Bob joined the Citizens Hose Company #5 in 1973 and never left. He was the mayor of Lock Haven from 1992 to 1995. He sat on the board of the Piper Air Museum. He volunteered for many years as an EMT and was a founding member of the Citizen’s scuba underwater search and recovery team. His wide-ranging interests and enthusiasms led him to jobs far beyond his initial schooling. A graduate of Lock Haven High School, he studied at Emory Riddle in Florida before transferring to Northrup in Los Angeles, for a degree in aeronautical engineering in 1968. He worked for Piper Aircraft in Lock Haven, and in the 1980s, traveled the country as a Piper crash investigator. He owned several businesses—a VW/dune buggy conversion shop and then a Kawaski dealership on Bellefonte Ave. as well as a lumber pole peeling operation in Beech Creek. He also worked four years as a manufacturing engineer for General Telephone and Electronics in Williamsport. He was recruited out of retirement by Truck Lite in McElhattan, where he went back to work as a networking engineer on the computer team that produced LED tail lights. Bob was the master of many skills, from photography—he created his first darkroom as a teenager in an unused closet—to any kind of electronics—computers and gadgets of all sorts. Bob loved the outdoors. He was a downhill ski instructor, a water skier, and a certified NAUA scuba diving instructor. 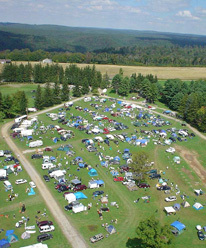 As a member of Central Pennsylvania’s Astronomy Club, he organized star parties in the remote mountains of northern Pennsylvania. A history fan, he participated in Civil War reenactments in Florida and also provided his EMT skills. But his greatest outdoor adventures involved vehicles of any kind. As a young man, he drove his Mini Cooper in Sports Car Club of America-sanctioned road races; he scrambled dirt bike motorcycles; and recently he enjoyed riding the backwoods in off-road Polaris RZRs with his friends and extended family. Family counted with Bob. He was married to Ginny (née Logan) for 27 years. Although their marriage ended in divorce, they remained friends until her death in February of this year. Bob was always active in raising his two sons, Peter and David, including volunteering as a leader in the Swissdale Boy Scout Troop 56. He maintained a warm relationship with his sons after they were grown. He welcomed David’s wife Kimberly and his first grandchildren, Logan and Gavin. On weekdays, Bob and David could be found having lunch at The Second Cup, enjoying their shared interest in solving the problems of heavy equipment. Bob was so pleased when Peter arrived home from the Philippines with wife, Richelle, and two more grandsons, Jeff and Alexander. Both sons and their wives were at his bedside when he passed. While Bob’s active mind and hands are now still, the memories of all he accomplished will remain in the hearts of those who knew him. The funeral service will be held Saturday, July 25, 2015 at noon at the Donald G. Walker Funeral Home, Inc., 231 High St., Flemington, Pa 17745. Family and friends will be received from 10 AM to 12 PM. Pastor Susan Champion will officiate; Interment at Highland Cemetery. In lieu of flowers, memorial contributions in Bob’s name will be accepted to Clinton County Relay for Life, through the funeral home. Our meetings are open to the public. They are held on the first Thursday of each month at the South Hills Business School in State College, PA from 7-9PM.